Each chair is custom made for you. Your special requests are welcomed for discussion and consideration. 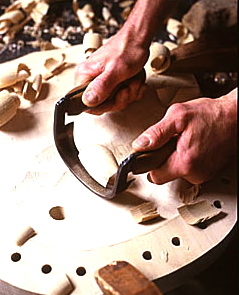 Design possibilities (where not shown) such as adding or deleting hand-carved knuckles on the arm, or hand-carved ears on the comb are options to consider. Aged painted custom color finishes are also available. A phone call is preferred so that I can discuss your order with you personally. 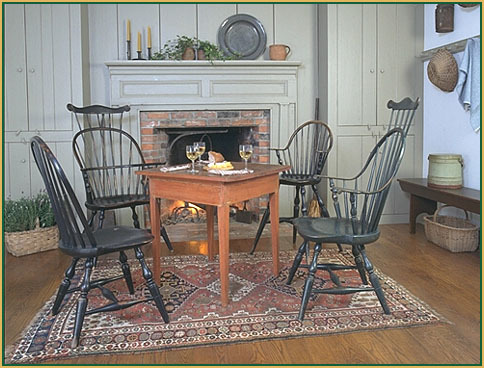 As always, the chairs can be seen and ordered at shows or by appointment in our home. You may also order by mail. All mail orders will be confirmed with a phone call to discuss design details and the finish desired. A 25% deposit is required with your order. You will receive a written confirmation within 10 days of placing your order. The balance is due prior to shipping. An approximate delivery date will be established at the time you place your order. There are several options for delivering your chairs. I will call you to discuss shipping options and rates.